In an effort to improve the sonic qualities of the recording, Desert World was conceived differently from its predecessors. The most difficult and crucial part of recording had always been the drums which are the bedrock of the song and all subsequent parts must marry with. Previously we had recorded together all the parts including the drums and then slowly replaced most of the other parts with better sounding, better played versions at our leisure. This is a tried and true method used for decades by many bands and producers but does rely on the drums being played and recorded well at the time. This time, the band decided to use the well known local (Melbourne) Atlantis studios and the talents of owner Dave McCluney to record drums. We again recorded all parts and multiple drum tracks using the popular ADAT technology of the time and then took the tapes into our new recording home at Casa DiIorio in the shed of Vittorio's family home. There we transferred the recordings into the brand new computer setup running Logic Audio and an 8 channel (!) interface. Technology was improving the ability of the band to capture a better sound. After fiddling with the machines for many hours we realised they were running out of time and would not synchronise, so we used some clever work-arounds to get the drums into the computer at the correct tempo and keep the timing correct. Then we added parts in our usual laborious way for some years before we decided enough was enough and we would release the creations. This album is probably the most cohesive in the sound and the conception of the songs, most originating from Paul again with additional instrumental material from Vittorio ('Goblins'). Desert World is a concept album set on Mars. Interestingly, one of the songs, 'Mutants' dates from the earliest days of the band as was used due to its humourous approach and relevance to the concept. 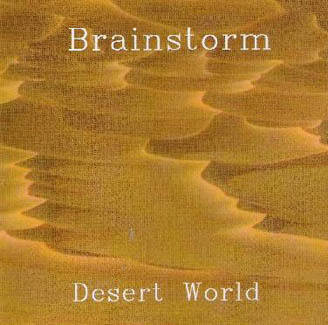 Desert World is the purest album by Brainstorm in the sense that it delivers a cohesive set of psychedelic spacerock songs, the musical genre that the band aspired to from the beginning.